For having congruent triangles, we have to consider the following important points. 1. They must have exactly the same three sides. 2. They must have exactly the same three angles. 3. If there is a turn or flip, the equal sides and angles may not be in the same position. But they must be there. If two triangles meet the first and second conditions, then they are said to be congruent triangles. Now the question we have is, how to check whether the triangles given are congruent. We can use the following rules or postulates to check whether the given two triangles are congruent. SSA and AAA can not be used to test congruent-triangles. Let us discuss the above postulates in detail. If two sides and the included angle of one triangle are congruent to two sides and the included angle of another triangle, then the two triangles are congruent. 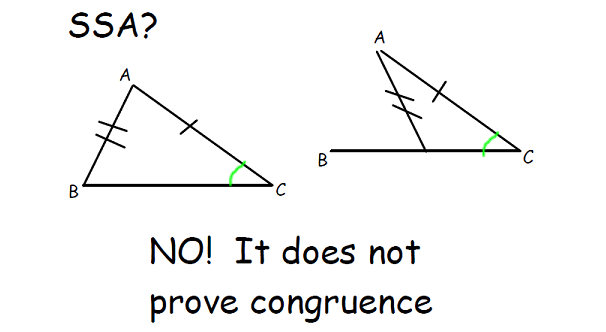 If two angles and non-included side of one triangle are congruent to two angles and the corresponding non-included side of another triangle, then the two triangles are congruent. We have seen that SSS, SAS, ASA & AAS are triangle congruence postulates. The explanations and the figures given above clearly illustrates how SSS, SAS, ASA & AAS show that the two triangles are congruent. Sometimes, students will misunderstand that as if SSA & AAA were triangle congruence postulates. Let us see, how SSA does not prove congruence. Please look at the picture given below. The above picture clearly illustrates that SSA does not prove congruence. When we look at the picture above, we do not need words to understand why SSA does not prove the congruence. Because the picture itself clearly speaks the fact. We hope that the students can understand everything from the picture. 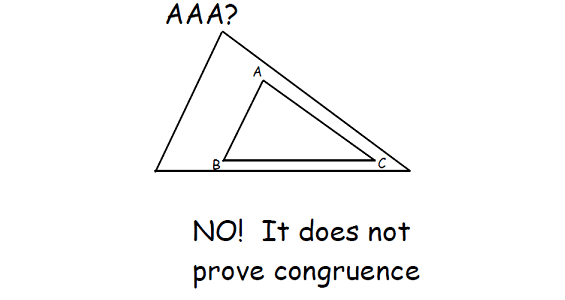 Now, let us see, how AAA does not prove congruence. Please look at the picture given below. The above picture clearly illustrates that AAA does not prove congruence. When we look at the picture above, we do not need words to understand why AAA does not prove the congruence. After having gone through the stuff above, we hope that the students would have a clear understanding about triangles concurrence.